Grouping Students for Literacy Success! Awhile back, I wrote a post about how I quit whole group instruction. This simple change has made such a difference in my classroom, but it has not been without it's growing pains. I am still learning and evolving this process in order to ensure that every student is getting the best of me and the best out of their time in my classroom. Where I teach, we use a pretty heavy methodology of homogeneous grouping. In other words, students are grouped with other students of like academic ability. Students are grouped into classes based upon their scores on state-given standardized tests. The tests are scored in a range of 1 to 5, so students are grouped with other students who scored similarly on that exam. But as we all know, one exam is hardly an honest measure of a students ability level, so undoubtedly, in every classroom there is a wide range of needs and ability levels. I typically have the lower-performing students who struggle with literacy, and I also teach the sheltered ESOL students, so I can have a very wide range of proficiency levels in one classroom. In the past, I have grouped students heterogeneously in such a way that eased classroom management stress. I spread out the more difficult students and then plugged in the rest to ensure that I wasn't spending the entire period managing off-task behaviors. Obviously, this was not an effective strategy. Heterogeneous grouping, or the grouping of students in mixed-ability groups, often means that the one or two "smart" kids do all of the work while the others are off-task or picking their belly buttons. I notice this when I work with small groups - the one or two who understand what's going on contribute in the group while the others happily sit and contribute nothing. This also did very little to mitigate behavior problems in the classroom. I also tried homogeneous groups, or grouping students of like ability levels, and had mixed results as well. This often resulted in many of the more problematic behavioral students to be put into the same group, behavior issues ensue, and there is an inability for peers to support one another. When I work with the "lower" group, they often sit and stare at me and don't contribute much. The problem with having an entire group of kids who are all waiting for someone else to do all of the work is that no one ends up doing any work. Conversely, my higher-level groups often become bored or overly chatty because everyone wants to contribute and there tends to be stronger personalities trying to out-do one another. Neither of these result in overall success. 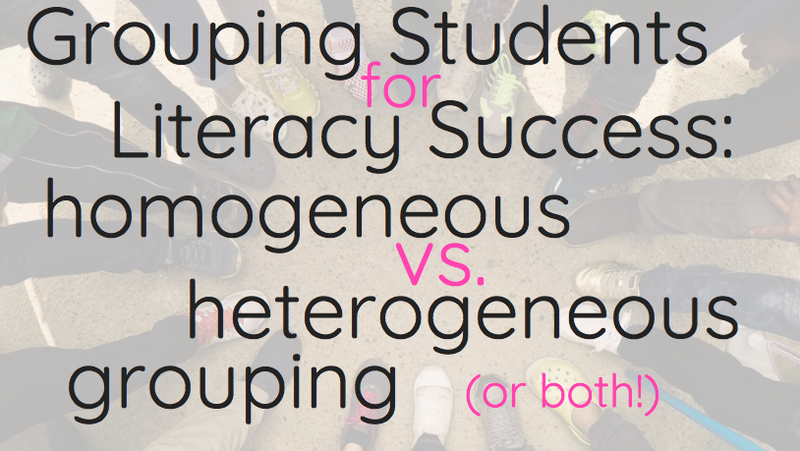 Most contemporary research suggests that heterogeneous grouping is the best fr literacy success because the higher students will support and pull up the struggling students, and on paper this makes sense. In practice, this can be more difficult for the reasons I experienced in my own classroom. This seems like a very simple solution, but the truth is that sometimes the simples solutions are the most effective. When I am working on reading intervention strategies or working with our reading intervention curriculum with my students, I group them homogeneously. This allows me to target specific literacy needs within each group. One group might need to focus on phonemic awareness while another needs to focus on comprehension. Obviously by grouping students based on need, I can effectively meet these needs. When students are working with new concepts, practicing new skills, or collaborating in any way, I group heterogeneously. This allows for peer support for my lower-performing students, and also allows for the sharing of ideas by different perspectives. In order to combat the problem of one or two students in the group doing all of the work while the others drool on themselves, I simply assign each member of the group a job. Each member has to perform their job in order for the group to be successful. Students are graded based on how they perform their own job, and how the group performs whatever task they are assigned as a whole. This creates accountability. I call my groups A-Groups and B-groups, but if you want to get fancy with the names, you can :). Some days we do A-groups, which are our homogeneous groups for intervention and skills, and other days are B-group days where we work on new standards/skills or practice something we've recently learned. These routines take some time for students to master, but if you are consistent, they will catch on quickly. Mitigating behavior issues in heterogeneous groups requires a much more difficult solution - patience, perseverance, and clear expectations. Have a list of expectations for groups, stick to them, reiterate them continuously (until you want to bang your head into a wall), and after awhile (a long while) they will get it. Some students are more stubborn than others. Have a plan in place to enforce behavior and encourage positive behavior, and stick with it no matter what. Try to stick with your groups for several weeks. I like to switch my heterogeneous groups at interim or end-of-quarter. This means every 4-5 weeks, students change groups. I re-visit my homogeneous groupings every quarter and base any changes on student data. Sometimes a student needs to me moved up to a different group in between, so I make those changes as they arise. This is especially the case in my ESOL classes where sometimes a student can turn a corner one day and suddenly be noticeably more proficient in English than he was the week before! If you are new to working in small groups, it can be extremely frustrating at first. Some days feel like a complete wash, and that's okay. It takes a bit of time for you and your students to learn new routines. Merging homogeneous and heterogeneous grouping, in the end, can be a blessing and once you're cruising, you will get so much done and the day will fly by!